- Single spin-on filter for the diesel heater. Filter from fuel transfer system. Looks pretty good. From the day tank, fuel is drawn out by the various consumers, filtered again by other filters, with some portion returned to the day tank only to get cycled through again. Below is the filter for the main engine. Note that it is significantly more fouled than the transfer filter. But why? One possible explanation is that the engine returns a large portion of fuel back to the day tank, the fuel actually gets filtered over and over again. 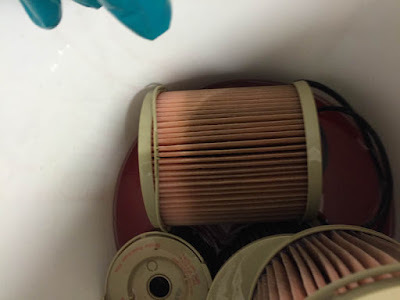 But after one pass through the transfer filter, and one pass through this filter, where is all the crap coming from that gets collected in subsequent circulation? Another possible explanation lies with heat, and we were just discussing this on the Nordhavn Owners Group. Deere and Lugger engines (the engines most widely used on Nordhavns) are very tolerant of hot fuel (over 200F), so they almost never have fuel coolers. In contrast, Cummins engines require that the fuel be kept below something like 130F, and are all equipped with fuel coolers. The fuel gets hot, by the way, as it circulates through the engine and is returned to the day tank. Newer common rail engines heat it up even more when it is pressurized. One interesting comment from the Nordhavn discussion was that hotter fuel tends to release more asphaltine which are small tar-like particles. I suspect that's what's going on here, but don't know for sure. Anyone know? Main engine filter looks much worse, but why? Probably not (too simple), but thought it worth mentioning for the discussion--are your downstream filters (from the day tank) finer? A question please: have you found a tool you are happy with for cutting open your filters? I need to do that on my boat as well. Just curious...are your dual Racors in series or parallel? Mine are parallel so that one sits unused as a backup in case the other Racor filter blocks. I never move the lever from position #1 until I replace #1, then throw the lever to #2 for a year or so while #1 sits unused as the standby. My thinking is that since mine is parallel, why change both at the same time? The dual Racors servicing the main engine I think are like yours. 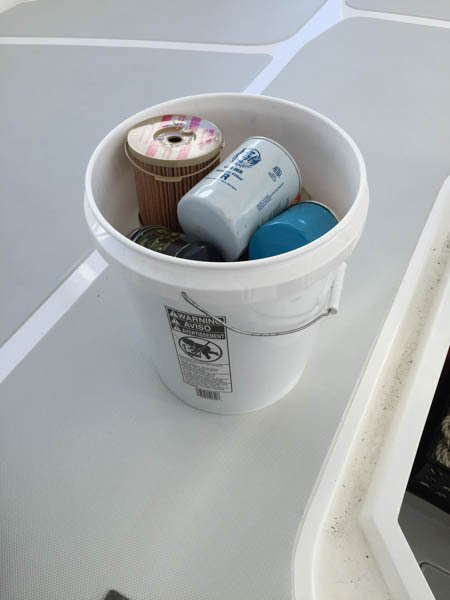 It's a pretty common arrangement and a pre-packaged system from Racor. There is a selector valve to select which filter you want to use. The idea is that you can run on one filter until it's plugged, then throw the lever and switch to a clean filter without having to shut down the engine. You can then change the spent filter at your leisure. There is also a "Both" setting, but that makes no sense to me. Like you, I always run on one filter, holding the other in reserve until needed. To date, I have never had to switch filters, and I hope to keep it that way. So over the past year of service my dual Racors have effectively been a single filter. 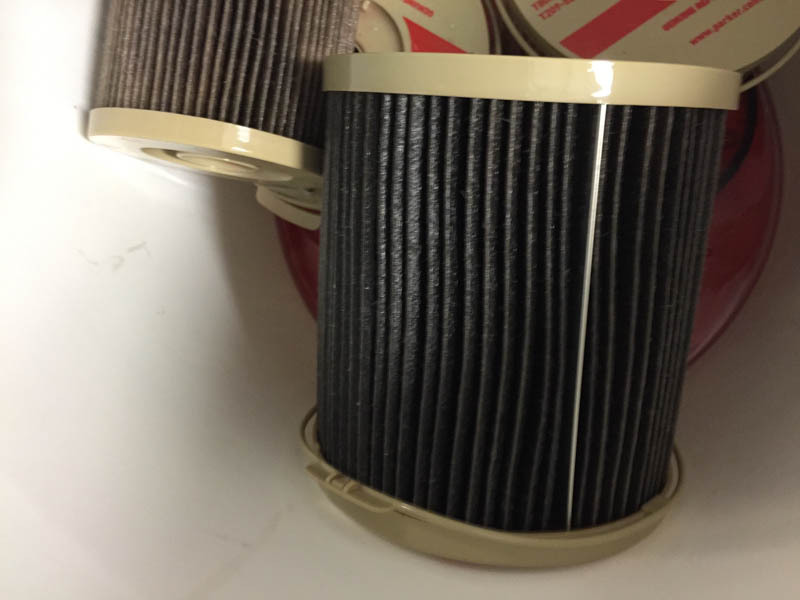 Racor calls for changing the filters at the earliest of 1) 500 hrs, 2) 1 year of service, or 3) when vacuum becomes excessive. In this case, the 1 year and 500 hr thresholds came up at about the same time. To date I have always hit the 1 year threshold, so have always changed both filters, including the unused one. My understanding is that they have a limited life once immersed in fuel, and will start to degrade if left too long. Or maybe it's the water repellent coating to degrades. I don't recall. How long is too long? I have no idea, but for $10 I just replace them on the recommended 1 year schedule even if they haven't been used. If I were hitting the 500 hr mark or plugging filters in less than a year, I would do as you describe - switch to the standby filter, swap the bad one, and keep running. I just wouldn't leave a filter in for more than a year, even if unused. Things grow in tanks Peter. Not saying that is what is discoloring your filters but that may be part of it, especially with warm fuel. A few years ago I was considering the purchase of an N55 berthed in tax purpose Ensenada and San Diego. The tanks and filters had become completely fouled with stuff, The 3/4 full tanks had to be emptied and cleaned and the owner was debating to not use the old fuel. Never heard the end story as we made an offer on a different N55. There are times my filters come out looking like new after a year and other times like they were well used. On fuel farms I have seen the early stage fuel filters and centrifuges very cruddy - doing their job. Barges and ship holds can be very messy. that extra step or two from the refiner adds a lot of crap.